Blue Reef Cottages are committed to providing a good quality service while also minimising the environmental impact of our activities. A symbol of this commitment is our membership of the Scottish Tourist Board’s Green Tourism Business Scheme. This Scheme provides accreditation and encouragement for tourism businesses to reduce the environmental impact of their activities. By encouraging sustainable practice it ensures the continued enjoyment of the environment of Harris for future generations. 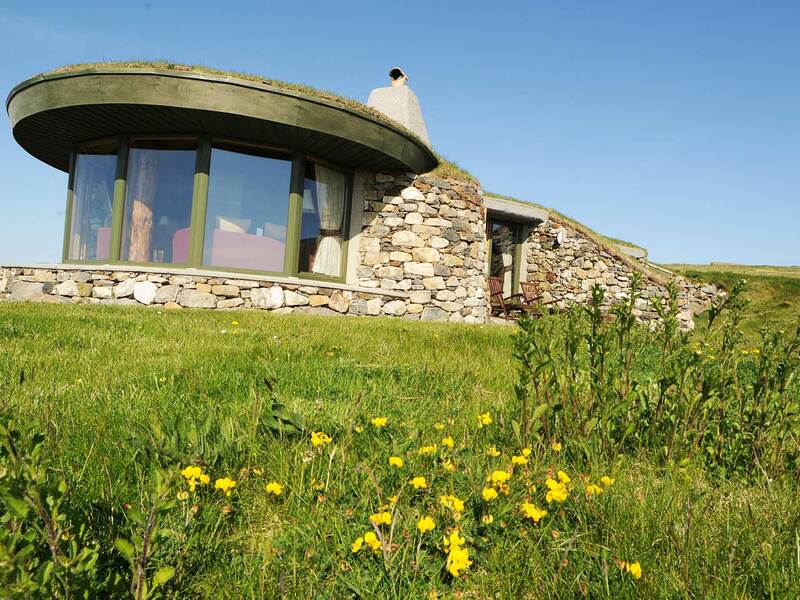 Set in the beautiful village of Scarista, Blue Reef Cottages consists of two turf roofed stone cottages designed to blend into the rugged coastal landscape, drawing on traditional island building techniques and incorporating unique touches. The pièce de la rèsistance is a glass fronted observation area, which has stunning panoramic views of idyllic beaches and the Atlantic Ocean beyond. 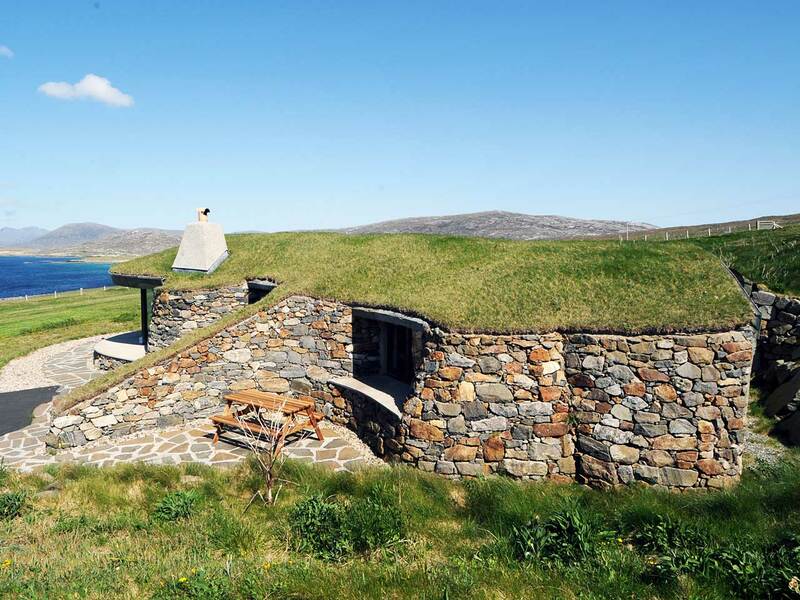 In its May 2009 article the top 12 Ethical Hideaways, Harper’s Bazaar named Blue Reef Cottages, “Best for watching the midnight sun.” Hard to get to, but the magazine says it’s worth ‘the trip’ to enjoy these remote cottages offering spectacular beach views and gourmet food on the Isle of Harris in the Outer Hebrides. Each eco sensitive cottage comes with a sauna and Jacuzzi. “Glorious countryside,” a great restaurant is a 10 minute-walk away. The whole of Harris is designated as a National Scenic Area and is administered by Scottish Natural Heritage (SNH). 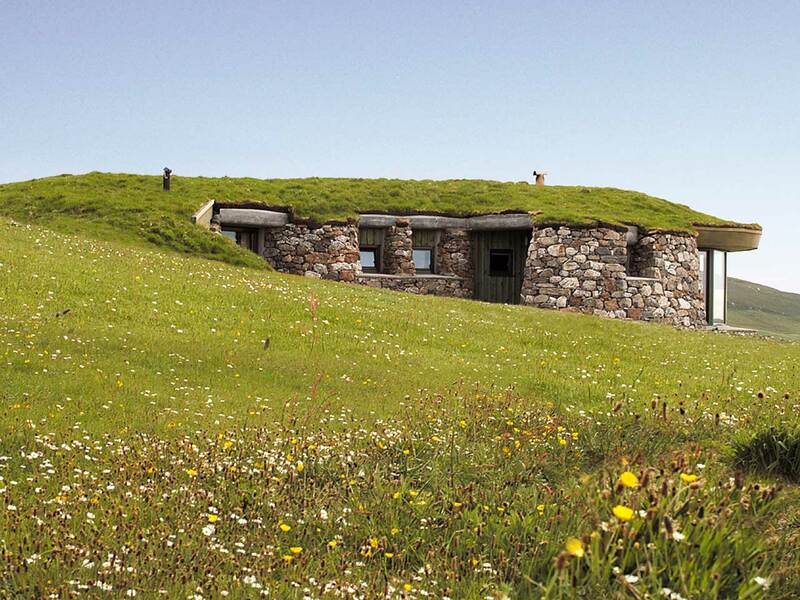 Harris is ideal for observing some of the British Isles rarer species, such as otters, seals and eagles. There are many walking and cycling routes to enjoy, and the island’s beaches offer unforgettable views. Blue Reef Cottages are committed to an environmentally-friendly practice and have received the Gold Award from the Green Business Tourism Scheme. “We are proud to have achieved this award and we are committed to reducing the impact we have on the environment”. At Blue Reef cottages our Green activities include – recycling waste, using low energy light bulbs, using local, fair trade and environmentally friendly cleaning products. Additionally we provide detailed information for those interested in cycling, walking and outdoor activities. We also encourage our guests to use local suppliers, who source locally and seasonally available foods. All this contributes to keeping money within the local economy and supports local businesses. There is plenty of information available in the cottage on local transport, walking and cycling and every consideration is given to the needs of the tourist during their stay. These provide a good wildlife habitat where ‘Machair’ flowers can be seen growing out of the roof during the summer months. 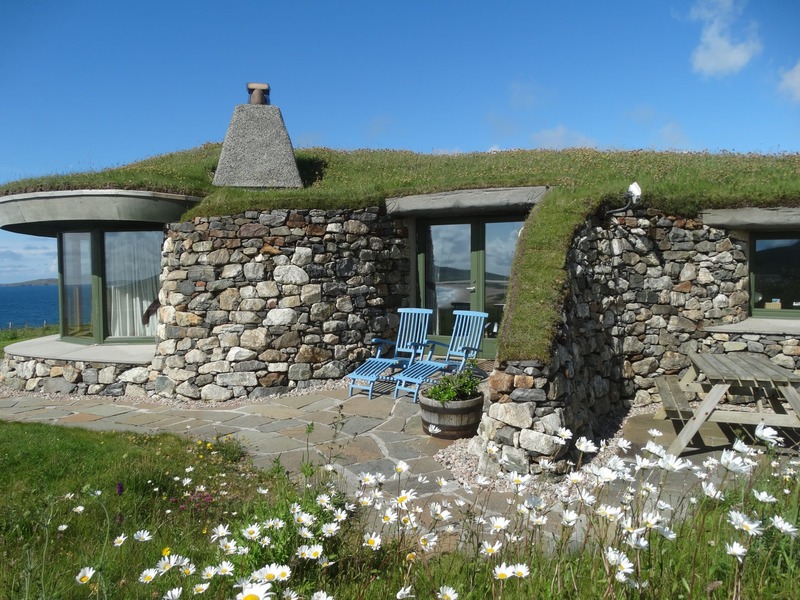 A green roof can absorb up to 75% of the rainwater that falls on it, also the insulating properties of a turf roof enable it to effectively regulate the temperature inside the cottages. 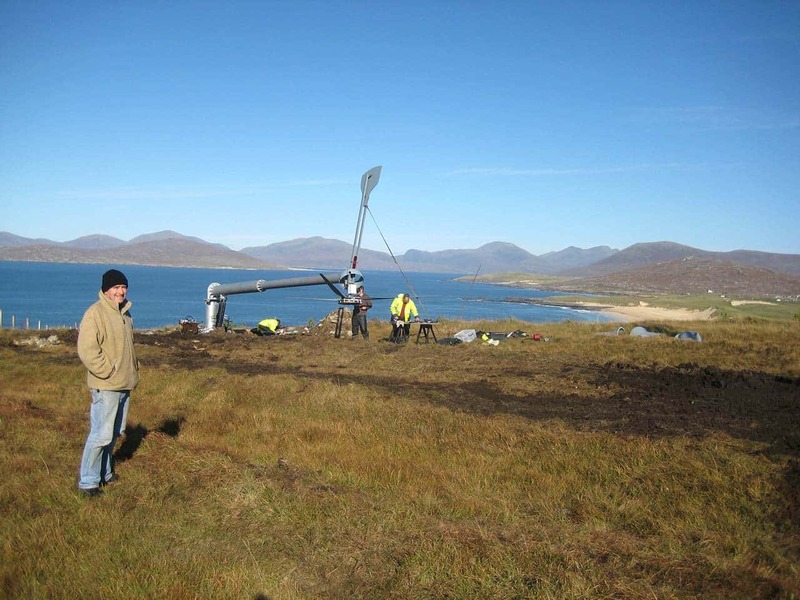 In October 2011 we installed two 5 kw wind turbines at the base of the hill behind the house – 300 meters away. One serves the house and one serves the cottages. We are probably one of the few people on Harris who now appreciate our windy weather! They are currently producing sufficient energy for all three properties. You can now relax in the sauna in the knowledge that it is not increasing our carbon footprint. The Evance R9000 5kW wind turbine has been engineered to ensure maximum energy yield by generating energy at low wind speeds, and by running continuously and safely at high wind speeds – the most efficient 5KW turbine available. A key design criteria of the R9000 wind turbine was the visual aesthetics of the system. The result is a modern and visually pleasing wind turbine which has a minimum visual impact on its surroundings. Blue Reef Cottages are committed to providing a good quality service while also minimising the environmental impact of our activities. © Blue Reef Cottages 2019. Website by Pelican Design Consultants. Booking system by SuperControl.